Innovation - It's Cooler master's Thing The MasterLiquid 240mm AIO hydro cooler features the greatest advantage of being silent, providing less noise and vibrations. Cooler Master controls quality and builds on decades on innovation with 100% in-house design and manufacturing. Featuring MasterFan Air Balance blades which push air further out of your system keeping it highly cool. The FEP tubing and tube sleeves are made with factory-grade sealant and you get all the benefits of FEP tubing in a slick cover. Many of Cooler Master's products are known for their easy installation so your build will be hassle-free. get the heat outside This liquid CPU cooler includes x2 120mm fans with MasterFan Air Balance blades, which push air farther out of the case and are quieter than high static pressure fans. Plus, they'll last just as long as your liquid cooler. 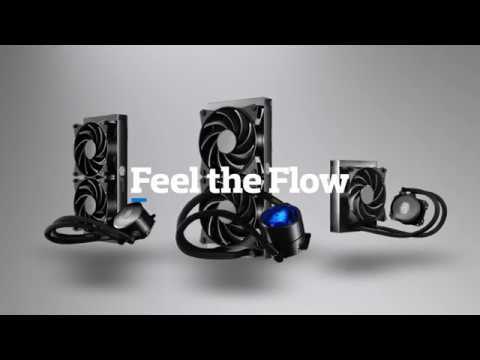 get the quietest liquid cooling One of the greatest advantages of the MasterLiquid 240 and liquid cooling in general is silence. The robust build of MasterLiquid coolers mean less noise and vibration, making Cooler Master's All in One coolers some of the quietest in-class. FRP construction is strong yet lightweight Its fiber-reinforced polymer (FRP) construction resists a broad range of chemicals and is unaffected by moisture or immersion in water. The Cooler Master pump is light and impervious to oxidation and corrosion. compatible with intel & amd sockets The installation is quick and easy for both Intel and AMD platforms, with everything you need straight out of the box. Once installed, the MasterLiquid 240 requires zero maintenance for optimal silence performance. To fit the MasterLiquid lineup to the motherboard and install fans, all you need to bring are your two hands and a screwdriver. Cooler Master MasterLiquid 240, 240mm All-In-One Hydro Cooler CPU Cooler, 2x120mm Fan, PWM, Copper Base, Intel/AMD AM4 is rated 4.0 out of 5 by 1. Rated 4 out of 5 by GhostMotley2 from Replaced a Noisy Corsair H45 I purchased this to replace a noisy Corsair H45 which had a loud pump and fan, the CoolerMaster ML 240 only costs around £20 more than the Corsair H45 and is better in every single way, acoustics, mounting and cooling performance. I currently have this sitting on a ASROCK X99 Taichi and 6800k, with a 4GHz OC at 1.2v, I've never seen load temps exceed 69c and it idles around 35c, keep in mind this is with the fans set on the silent profile per the Taichi's BIOS, pump is at 100%, virtually inaudible, was a little loud at first but give it a few days and it should be fine. I did have one issue where one of the mounting screws broke, the cooler still worked perfectly fine and mounted but some tougher metal would be nice for future versions, anyway I contacted CoolerMaster and they sent out an extra 4 screws in case anything like this ever happens again. I highly recommend this to anyone looking for an affordable 240mm AIO with good acoustics, mounting system and cooling performance.